NNMAE.org • View topic - Nambe' Chutes? Yea thanks to John for carting up a real camera, he had everything but the kitchen sink in that pack! JohnS wrote: Nambe Chutes Report for the "Boot Out Chute/Styx" Friday, January 2, 2009. 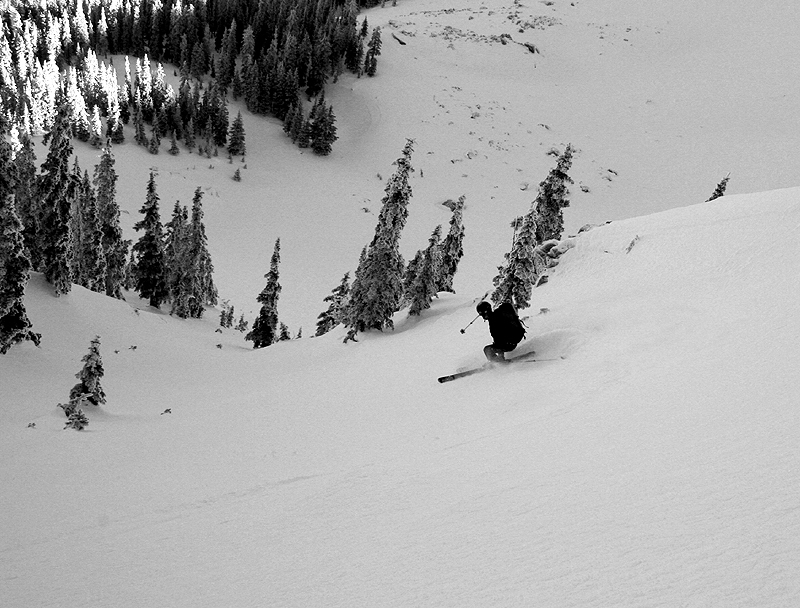 Paul aka "Nuro" and I skied the Nambe Chutes NNW facing chutes today. 54cm Snow Pack was very stable. 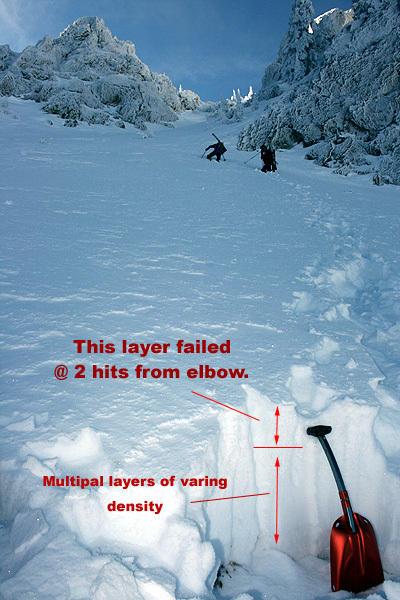 Snow Pack at the top of the chute we skiied has a top layer of 52cm with very firm snow sitting on 2cm of sugar. The entire 52cm layer feel very solid and consistant throughout. No signs of cracking or fractures on this chute. Performed a isolated column test. Column did not see fractures until hit 28. Was slamming the shovel as hard as i could from 20 - 28 with fist to get the fracture at 45 cm from the bottom up. The entire column felt very stable. Skied this chute first. Very interesting with the windblown textures. Just a few inches of powder on hard pack. Very similar conditions as last year. BTW - Way to get after it and share the stoke! Yup I hear Ya..... the way I figure it, all this avalanche work is like the "Pirates Code" from Pirates of the Caribbean, they are really just "Guidelines"
In the end it's up to each individual to decide what to do, and to your buddies to get you out if you screw up! How quickly things can change in the Nambe. 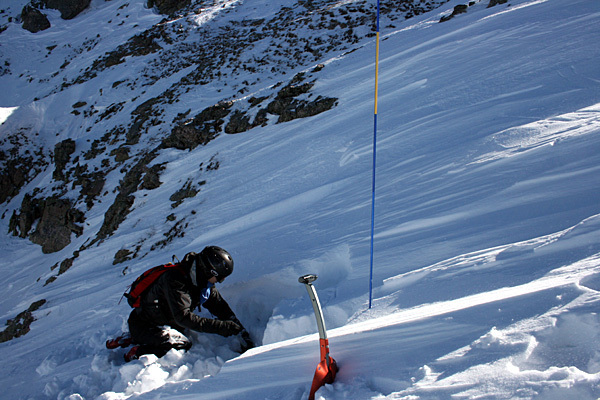 4 days ago reports from Marc Beverly and Kerry Hanes reported very hard pack wind slabs in the Nambe Chutes. With no new snow since their reports Paul, Joel and I expected the same conditions and did not expect to do any skiing in the Chutes. To our suprize an incredible amount wind blow snow had blown into the Nambe giving it a few inches of fresh snow. Snow felt like there was enough to have some fun so we dropped in to the lower chute marked on the Google map. This is a very fun chute at 40 degrees. Very Taos like. Snow felt very stable and no signs of cracks or fractures. Since the skiing was pretty good we decided to stay in the Nambe and boot pack up for another run on the next chute east. I dug a quick pit halfway up the chute on the 30 degree slope to see what was going on. The snowpack has definitely changed since Jan 2 with mulipal layers building up. The top 7-10cm being the weakest layer which failed at 2 hits from the elbow on a column test. Even with this failure the snow still felt stable BUT being on a 30 degree slope with a weak and multipal layers does bring concern. The boot up was a struggle at times in hip deep snow but for the most part not too bad and well worth it as the ski down was a blast. The Nambe moves mega tons of snow in and out on those crazy high wind days. Be interesting if this snow stays or gets all blown out. Last year Kerry saw 1 - 2 feet of snow get blown out of the Nambe in just a few days. 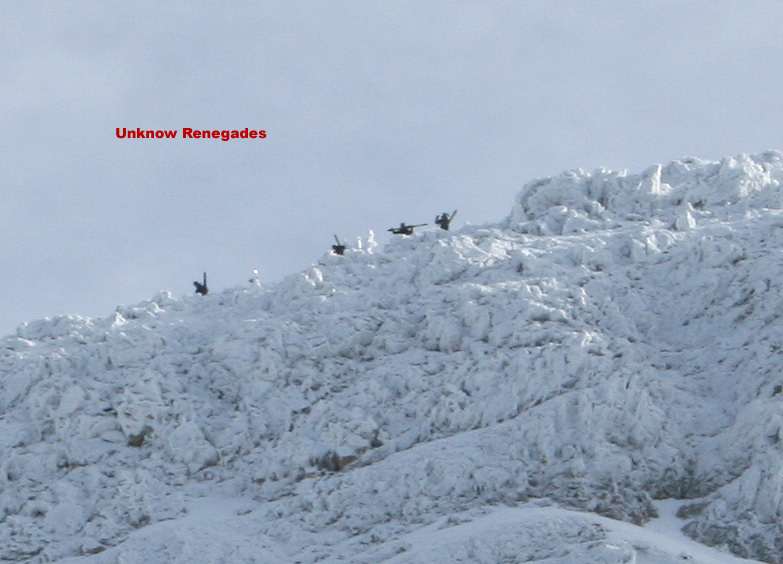 We did see a renegade band of 4 - 5 skiers doing the climb over Lake Peak to Heaven's Hill. Their voices of excitment echoed through out the Nambe. With this long stretch of no new snow, warm temps and wind it will be interesting to see what happens when we get the next big dump. Those "unknown renegades" were us... (Us, being Peter, TJ, Jamie, Kevin, and Gus). We were on our way to some nice powder stashed off of Heaven's Hill. We saw you guys laying down some turns. Looked like a lot of fun. 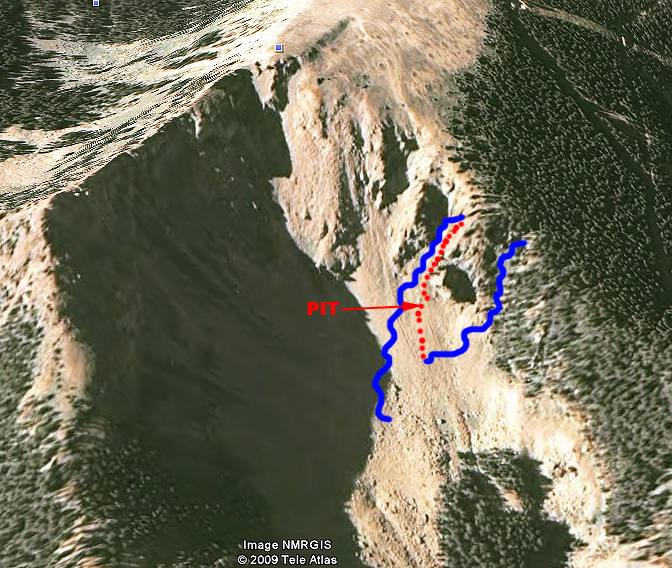 Has anyone been upto the Nambe chutes recently, since Kerry's last report of the area? Don't know but I plan on going up this weekend (don't know what day yet) to see for myself! Are you still thinking about nambe cirque this wkend? I was up there Tuesday 3/17. Awesome:) boot up was some work. What day you heading up? Sorry for the false alarm... I have to WORK now.... I want to head up NEXT weekend and need a partner. If anyone's interested let me know. 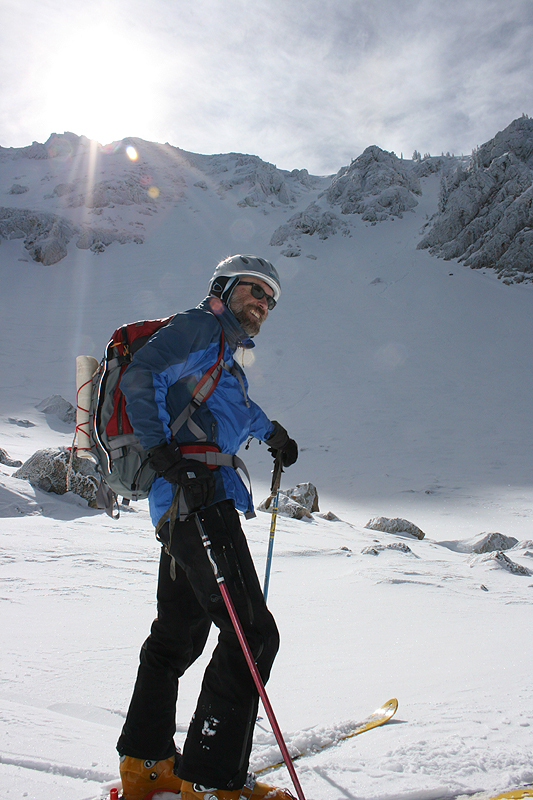 Enjoyed another day in Nambe cirque on Saturday. Entered via the boot out chute. Booted up to the Lake pk's west face via the semi exposed rock rib underneath N+4 chute. Made for any easy boot up. Came down N+3, then back up boot up chute. put this in the wrong place the first post.